Anthony Bourdain, called “Tony” by friends and colleagues, was born June 25, 1956, in New York City. 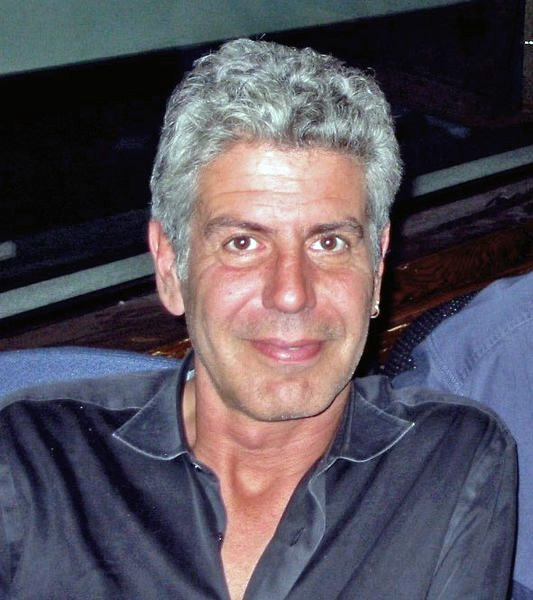 The eldest son of Pierre Bourdain, an executive for Columbia Records, and Gladys Bourdain, a staff editor for the New York Times, Tony spent most of his childhood in Leonia, New Jersey. Bourdain said he was raised without religion, but that his family was Catholic on his father’s side and Jewish on his mother’s side. His paternal grandparents were French: his paternal grandfather emigrated from Arcachon to New York following World War I, and his father grew up speaking French and spent many summers in France. He graduated from the Dwight-Englewood School – an independent coeducational college-preparatory day school in Englewood, New Jersey – in 1973, then enrolled at Vassar College but dropped out after two years. He worked in seafood restaurants in Provincetown, Massachusetts while attending Vassar, which inspired his decision to pursue cooking as a career. Bourdain attended The Culinary Institute of America, graduating in 1978. From there he went on to run various restaurant kitchens in New York City – including the Supper Club, One Fifth Avenue, and Sullivan’s. Bourdain's book, Kitchen Confidential: Adventures in the Culinary Underbelly (2000), a New York Times bestseller, was an expansion of his 1999 New Yorker article “Don't Eat Before Reading This.” As a well-known chef, his insights into the inner-working of New York’s top restaurants were well-received and helped launch his writing career. He wrote two more bestselling nonfiction books: A Cook's Tour (2001), an account of his food and travel exploits around the world, and The Nasty Bits (2006), another collection of essays centered on food. His additional books include Anthony Bourdain's Les Halles Cookbook, the culinary mysteries Bone in the Throat and Gone Bamboo, a hypothetical historical investigation, Typhoid Mary: An Urban Historical, and No Reservations: Around the World on an Empty Stomach. Bourdain’s articles and essays appeared in many of the world’s premiere publications, including The New Yorker, The New York Times, The Los Angeles Times, The Observer, Financial Times, Maxim, and Gourmet. The acclaim surrounding Bourdain’s memoir Kitchen Confidential led to an offer by the Food Network for him to host his own food and travel show, “A Cook’s Tour,” which premiered in January 2002. In July 2005, he premiered a new, somewhat similar television series, “Anthony Bourdain: No Reservations,” on the Travel Channel. In July 2006, he and his crew were in Beirut filming an episode of No Reservations when the Second Lebanon War broke out unexpectedly after the crew had filmed only a few hours of footage for the food and travel show. His producers compiled behind-the-scenes footage of him and his production staff, including their initial attempts to film the episode, their firsthand encounters with Hezbollah supporters, their days waiting for news with other expatriates in a Beirut hotel, and their eventual escape from the city. In May 2012, Bourdain announced that he would be leaving the Travel Channel. He went on to host “Anthony Bourdain: Parts Unknown” for CNN. The program focuses on other cuisines, cultures and politics and premiered April 14, 2013. President Barack Obama was featured on the program in an episode filmed in Vietnam that aired in September 2016. Between 2012 and 2017, he served as narrator and executive producer for several episodes of the award-winning PBS series “The Mind of a Chef.” Bourdain also appeared five times as guest judge on Bravo’s Top Chef reality cooking competition program. Bourdain was found dead of an apparent suicide in his room at Le Chambard Hotel in Kaysersberg, France on June 8, 2018. He was working on an episode of “Parts Unknown” when he took his own life. Bourdain was 61 years old.